"Quick and easy martini made with pineapple infused vodka that is sure to please!" Place the pineapple pieces into a large container, and pour the vodka over them. Cover, and refrigerate for 3 to 4 days. 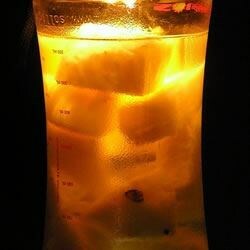 Strain out pineapple, and serve vodka over ice with a pineapple garnish. Watch a professional bartender make a sweet and fruity vodka cocktail. These are awesome, however I found that refrigerating made it take a lot longer to get rid of the bite of the vodka. I put the glass jar out in the sun for a few days and it sweetened right up! Got wasted on this last night. Sooo delicious, and really good with a splash of cherry liqueur too. Thanks! Very good. For an added twist i serve with an array of fruit juices so guests can 'make there own' but be aware that this can get you tipsy super fast when you cant even taste the liquor!